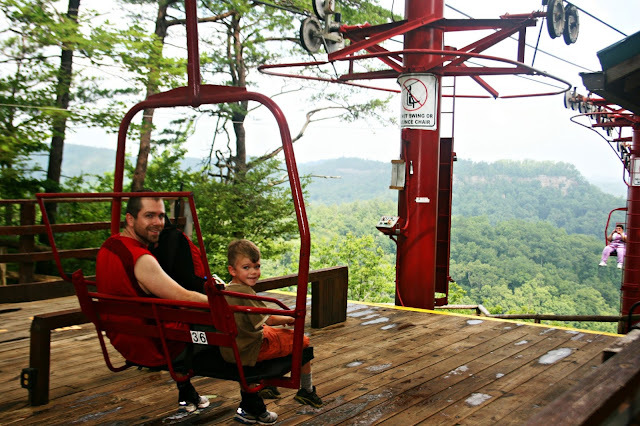 After a full morning of hiking, we decided to treat the boys to a ride down the mountain by skylift. Pierce was initially a little nervous. Cort, on the other hand, was very eager to go. He was talking about it all morning. Paul took Pierce with him, and I took the twins with me. It was steep enough to make my fingers tingle as we got started. Below the skylift, is the land of lost flip flops. I was glad that we all had our tennis shoes on this morning, since we had been hiking. By the time we got to the bottom, the boys were all excited they had been able to go. I jogged the mile to our car, picked them all up, and then we were ready to head to the pool. Readers, have you ever ridden a skylift? I want you to adopt me LOL, you have such fun and interesting times as a family, these are super shots and even though I don't like heights I'd of been happy to ride down after hiking up. Thank you for your kind words Lisa, they were very much appreciated. 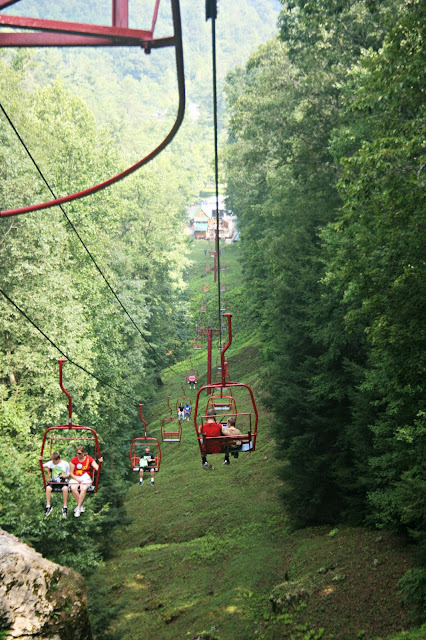 Wow that would be quit a ride, probably what they need to put in Roanoke to go up mill mountain. This looks like so much fun! My guys would really enjoy trying to ride on one. I know your boys had a blast! Beautiful photos, Lisa. I have ridden the sky lift at Stone Mountain Park. It's been years since I rode a ski lift. I grew up vacationing in Colorado in summer, so a treat then was to take a ride up and down the mountain on the ski lifts. We had a skylift at Lakeside Amusement park in Salem, Va. Just blocks from my house. The one ya'll went on looks a lot more fun! Yes I have - and I get butterflies every time .... but it is fun!!! Makes me tingle, too, but the view is always worth it! We did this a few times while in Colorado--gorgeous to see everything from so high in the air. looks cool. no. but i laughed at the flipflops. What great views !!!! Glad it went well ! Have a great day Lisa !!! scenery is beautiful! But I would be terrified!! I know they had fun and will have lots of good memories from that ride. 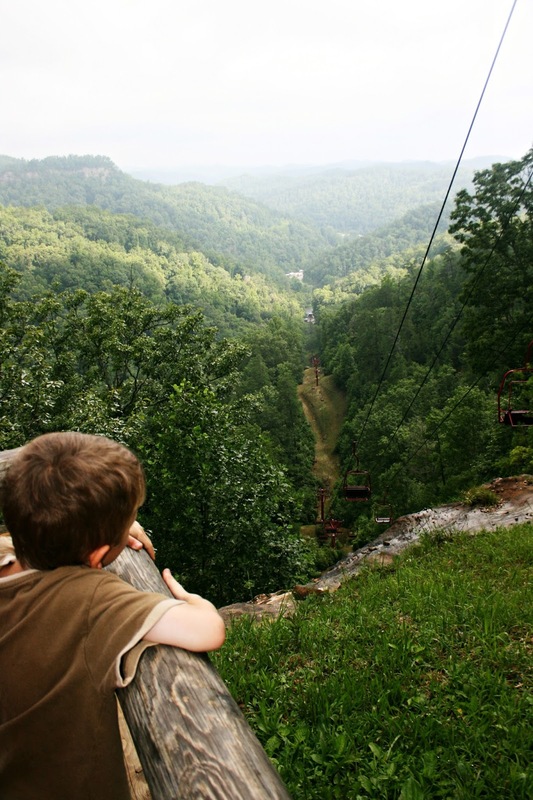 I have ridden a sky lift many times when I was younger. I would have a hard time doing it now though. I would probably get ill. I'm sometimes a little uneasy with those, but they go over way better than fast moving rides! I'm kind of a wimp when it comes to heights. I haven't ridden one, but I bet everyone in the fam. would love it. My son and family recently did, but not me, with my knack for freak accidents. Your pictures are awesome! The last two pictures are great! But my favorite today is "The land of lost flip-flops."!!! Great views! Larry and I rode one in Tennessee--I can't remember now whether it was in Pigeon Forge or Gatlinburg. But it was fun. I'm not great at heights, but I like the sense of "flying." BTW, I like your new header! I'm working on a new one, but it's taking me a long time. Such cool photos! I have ridden one before on a family trip when I was younger. I think now I'd be a little more frightened though! Those are always so much fun to ride! What an amazing view! Glad your boys liked it.....I think I might have been a bit nervous. Oh my gosh.. that did look steep. I have rode one of those before but it wasn't called a sky lift. Not sure what it was called. It would pick you up and ride you around a large park. There were no steep hills involved. I have ridden in one and since I don't like heights I wasn't very impressed! land of lost flip flops is funny! glad the boys had fun! 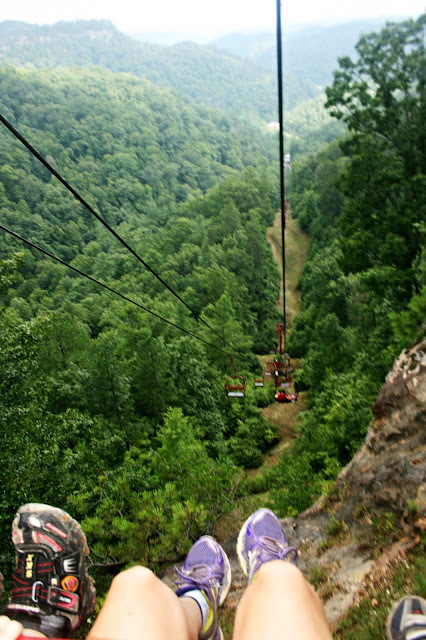 I have been on sky-lifts....not so fun for a girl who hates being so tall (5'3!) I'm fearful of heights. Glad the boys had fun!!! I have, several times. It was fun! Awesome views! I have ridden a skylift but it is NOT a favorite thing to do. Don't like heights.